Trains are a theme that keeps on giving. Every year, there are tons of new games with a train theme, and every year I get surprised by a few of them because they are not copies of existing games but new ideas. 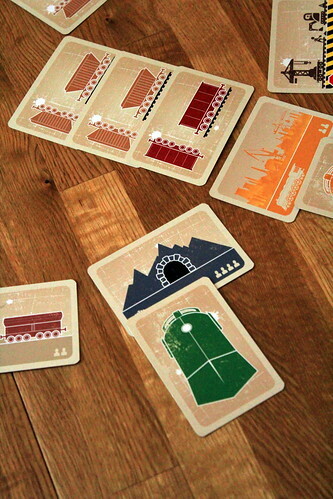 Cargotrain by Krzysztof Matusik is one such game. Just looking at some keywords, it doesn’t sound very fresh: a train-themed game with a pick-up-and-deliver mechanic and a side order of set collection. But that’s why we don’t reduce games to just keywords, because Matusik takes those familiar elements and creates an engaging game from them. 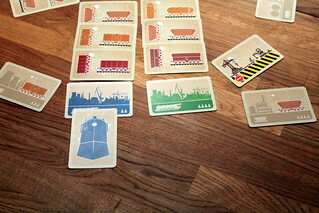 Cargotrain is a pure card game, there are no other components. Even the board is a circle of track cards the players’ trains move around. There are four different kinds of cards in the track. Industrial complexes are where your trains pick up cars. You have to deliver those cars to factories matching the car type. To make driving around in a circle more interesting, there are tunnels that let your train go from one entrance to the other in one move and the impassable railroad refit card. Anyone used to traveling by train knows that one, there’s always construction somewhere making you late. In Cargotrain, the construction works are especially annoying because they move around every round, blocking you at the worst possible moment. How to play Cargotrain is quickly explained. Every round, players pick three of their movement cards. At the star, players only have one card each showing a one, two and three, so the only choice is the order in which they use them. With upgrades to their locomotive they can add another three, a four and finally a card with a one and a two, to decide what number to use only when they move. With all the cards chosen, players take turn revealing their next movement card and moving their locomotive that many cards along the track. After each move, players take one other action. If their train is at an Industrial Complex, they may attach one or more wagons from the front of that complex’s line to their train. It’s important that they maintain the order of cars, the first one in line goes on the train first, then the next, and so on. Once attached to your train, cars can not change position in any way. In the beginning, that restriction is not important because your regular locomotive can only pull one car, anyway. Cars attached to your train can be delivered to a Factory. When you end your move on a Factory card, you can detach cars matching the factory from the end of your train, and only from the end. That’s why the order of cars is important, you can only deliver cars in reverse order from how you picked them up. At the Industrial Complex of your own color, you can upgrade your locomotive. Upgrades, as mentioned above, give you more movement cards – you still only pick three per round – and increase your trains capacity. You can pull one car per level of the train up to a maximum of four. As another possible action, you may reorder the cars in one Industrial Complex. You can do this to get to the car you want, but you can only pick it up on your next turn since attaching a car would be a second action. That gives your opponents ample opportunity to mess with your plans. And indeed, changing the order of cars is often used offensively, to deny an opponent the cars he wants. Of course, you have to guess correctly which cars he wants, first. Which cars you want depends on your routes around the track and on the final concept of the game: contracts. They are where the set collection comes into Cargotrain. Every player starts the game with a contract and can pick up more as an action. Each car delivered to a factory is already worth a point a victory point. With contracts, you can collect sets of cards for extra points. A typical contract might require five cars of the same type, four different cars, or three cars of one kind and two of another. While contracts are a great source of points, they are not without risks. Any unfulfilled contract when the game ends costs you two points. Cargotrain is not a complex game. The rules are easy to grasp and the most difficult thing in learning to play is remembering all the options you have after every move. A card with a quick overview of these actions would have been quite handy. It’s a tactical game that makes it hard to plan for the next round, with that annoying refit card moving around. Did I mention the round’s start player decides where the refit card? He does, and he’s unlikely to make anyone but himself happy with where he puts it. That’s another opportunity to mess with everyone. While Cargotrain is not a heavy game – I would call it family suitable – it’s interesting enough to play with your gamer crowd, too. It takes simple and familiar mechanics, puts them together in a fun and engaging way and packages that with a beautiful, minimalist design.